When the DCCRPG beta was first being played, how to gain experience and level up was a mystery. So I went with gold-spent equaling experience points. Then it kind of mutated into Carousing rules much like those that others before me have proposed. First, Jeff Rients came up with this famous table for carousing mishaps. 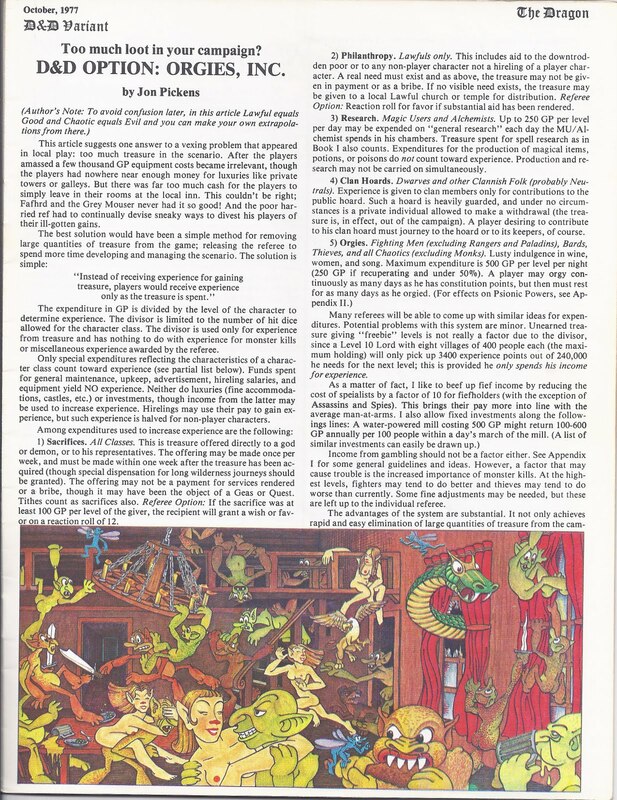 Then I found the old article on orgies from Dragon Magazine (warning NSFW cartoonage). Ideas were gained. Your character doesn't like to level up by partying like Conan? Not a problem. Check out Martial training, holy Sacrifice, and Esoteric research. But if wine and wenches is your bag, check out the system below. 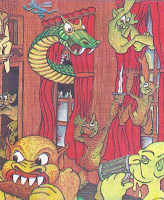 When you perform this leveling action, you must roll a Carousing check (1d20+ luck mod, DC 15 for success), spend your gold (which becomes XP), then role-play through the results (though the DM can just tell you what happened). Success nets you a roll on the right side of the following table as a kind of bonus to the joy of getting XP. Failure means nothing special, but rolling a 1 means you have to roll on the left side of the table!